In September I had the privilege of sitting on a round table at the Digital Humanities Autumn School at the University of Trier, along with Manfred Thaller, Richard Coyne, Claudine Moulin, Andreas Fickers, Susan Schreibman, and Fabio Ciotti. Per standard procedure we were given a list of discussion questions to think about in advance; as with any such discussion panel, especially when the audience weighs in, the conversation did not follow the prescribed plan. Lively and worthwhile as the round table was, it would still be a pity for my preparation to go entirely to waste. Richard published his own reactions to the questions beforehand; I’ll join him by presenting mine here, in retrospect. This turns out to be a rather longer piece than I initially envisioned, and so here I present the first in what will be a five-part series. 1. The field of digital humanities is characterized by a great variety of approaches, methods and disciplinary traditions. Do you see this openness and dynamic as a chance or even necessary condition of the field or do you think that this endangers its institutionalization in an academic environment which is still dominated by disciplines? Does it make sense to make distinctions between specific disciplinary approaches in DH, for example digital history, digital linguistics, or digital geography? If we leave the word “digital” out of the first sentence, it holds perfectly true – the humanities are heterogeneous. Thus I don’t think it is really any surprise that the digital humanities would be the same. Computational methods have developed fairly independently in the different disciplines, which does make specific disciplinary approaches rather inevitable – there are digital methods used primarily by linguists, that have been developed and shaped by the sorts of questions linguists ask themselves. These questions are very different from the sorts of questions that art historians ask themselves, and so art history will have a different set of tools and different methods for their application. And so we might perhaps better ask: does it makes sense to not make distinctions between specific disciplinary approaches in DH? That said, the answer to this question is not so clear-cut as all that. In practice, very many people inside and outside the field think first of methods for text processing – encoding, tagging and markup – when they hear the words “digital humanities”. And so as a community, digital humanities practitioners tend to be extremely (though not exclusively, of course) text-oriented. Some of these conceive of the elements of DH pedagogy in terms of a specific set of tools; these usually include the XML infrastructure and TEI encoding for different text-oriented problem domains, as well as analysis of large (usually plain-text) corpora, which can include a combination of natural-language processing tools and statistical text-mining tools. That said, while text may be the Alpha of DH it is no longer the Omega – in the last five to ten years the archaeological and historical sciences have brought methods and techniques for mapping, timeline representation, and network analysis firmly onto the scene. One nevertheless retains the impression of Digital Humanities as a grab bag of skills and techniques to be taught to a group of master’s students, knowing that the students will perhaps apply 20-40% of the learned skills to their own independent work, but that the 20-40% will be different for each student. So then, can digital humanities really be called a field or a discipline? It’s such a good question that it comes up again and again, and many people have attempted answers. The answer that has perhaps found the most consensus goes something like this: digital humanities is about method, and specifically about how we bring our humanistic enquiry to (or indeed into) the domain of computationally-tractable algorithms and data. That question of modeling would seem to be the common thread that unites the digital work going on in the different branches of the humanities, and it brings up in its turn questions of epistemology, sociology of academia, and science and technology studies. What bothers me about this answer is that it gives us two choices, neither of which are entirely satisfactory: DH is either an auxiliary science (Hilfswissenschaft, if you speak German) or a meta-field whose object of study is the phenomenon of humanities research. The former is difficult to justify as an independent academic discipline with degree programs; the latter is much easier to justify, but appeals to something like 1% of those who consider themselves DH practitioners. I haven’t come up with an answer that I deem satisfactory, that ties a majority of the practitioners to a coherent set of research agendas. In that case, a reader might reasonably ask, what is it that I am trying to accomplish, that fits under the “Digital Humanities” rubric? To answer that question, I have to say a little about who I am. I am extremely fortunate to be of the generation best-placed to really understand computers and what they can do: young enough that personal computers were a feature of my childhood, but old enough to be there for the evolution of these computers from rather simplistic and ‘dumb’ systems to extremely sophisticated ones, and to remember what it was like to use a computer before operating system developers made any effort to hide or elide what goes on “under the hood”. This means that I have a fluent sense of what computers can be made to do, and how thos things are accomplished, that I have been able to gain gradually over thirty years. In comparison, I began post-graduate study of the humanities twelve years ago. So my work in the digital humanities so far has been a process of seeing how much of my own humanistic enquiries, and the evidence I have gathered in their pursuit, can be supported, eased, and communicated with the computer. It meant computer-assisted collation of texts, when I began to work on a critical edition. It has meant a source-code implementation of what I believe a stemma actually is, and how variation in a text is treated by philologists, as I have come to work on medieval stemmatology. It has recently begun to mean a graph-based computational model of the sorts of information that a historical text is likely to contain, and how those pieces of information relate to each other. And so on. Nowhere in this am I especially concerned with encoding, standards, or data formats, although from time to time I employ all three to get my work done. Rather, I rely on the computer to capture my hypotheses and my insights, and so I find myself needing to express these hypotheses and insights in as rigorous and queryable a way as possible, so as not to simply lose track of them. Critics might say (indeed, have said) that my idea of “digital humanities” is a glorified note-taking system; those critics may as well call Facebook a glorified family newsletter. Rather (and for all the sentiment that DH is first and foremost about collaboration) the computer allows an individual researcher like myself to track, and ingest, and retain, and make sense of, and feel secure in the knowledge that I will not forget, far more information than I could ever deal with alone. Almost as a side effect, it allows me in the long run to present not just the polished rhetoric appearing in some journal or monograph that is the usual output of a scholar in the humanities, but also a full accounting of the assumptions and inferences that produced the rhetoric. That, for me, is what digital humanities is about. For the last three or four months I have been engaging in proper critical text edition, of the sort that I haven’t done since I finished my Ph.D. thesis. Transcribing manuscripts, getting a collation, examining the collation to derive a critical text, and all. I haven’t had so much fun in ages. 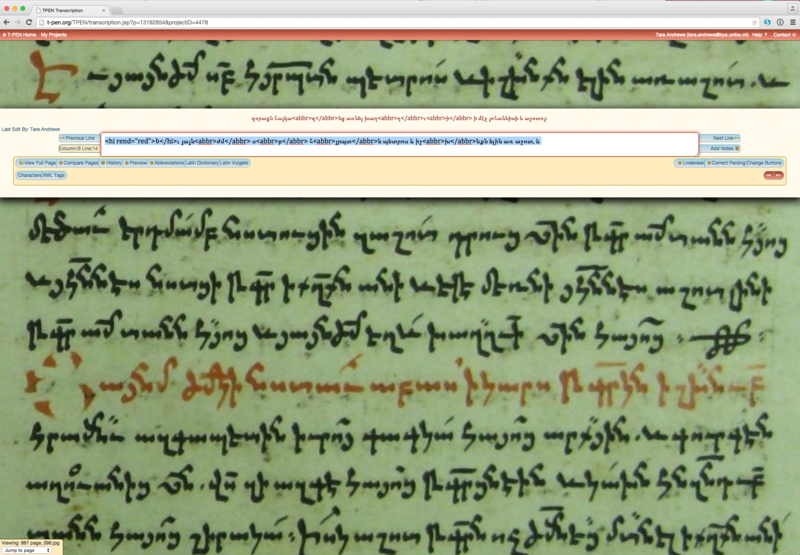 The text in question is the same one that I worked on for the Ph.D. – the Chronicle of Matthew of Edessa. I have always intended to get back to it, but the realities of modern academic life simply don’t allow a green post-doc the leisure to spend several more years on a project just because it was too big for a Ph.D. thesis in the first place. Of course I didn’t abandon textual scholarship entirely – I transferred a lot of my thinking about how text traditions can be structured and modelled and analyzed to the work that became my actual post-doctoral project. But Matthew of Edessa had to be shelved throughout much of this, since I was being paid to do other things. Even so, in the intervening time I have been pressed into service repeatedly as a sort of digital-edition advice columnist. I’m by no means the only person ever to have edited text using computational tools, and it took me a couple of years after my own forays into text edition to put it online in any form, but all the work I’ve done since 2007 on textual-criticism-related things has given me a reasonably good sense of what can be done digitally in theory and in practice, for someone who has a certain amount of computer skill as well as for someone who remains a bit intimidated by these ornery machines. Since the beginning of this year, I’ve had two reasons to finally take good old Matthew off the shelf and get back to what will be the long, slow work of producing an edition. The first is a rash commitment I made to contribute to a Festschrift in Armenian studies. I thought it might be nice to provide an edited version of the famous (if you’re a Byzantinist) letter purportedly written by the emperor Ioannes Tzimiskes to the Armenian king Ashot Bagratuni in the early 970s, preserved in Matthew’s Chronicle. The second is even better: I’ve been awarded a grant from the Swiss National Science Foundation to spend the next three years leading a small team not only to finish the edition, but also to develop the libraries, tools, and data models (including, of course, integration of ones already developed by others!) necessary to express the edition as digitally, accessibly, and sustainably as I can possibly dream of doing, and to offer it as a model for other digital work on medieval texts within Switzerland and, hopefully, beyond. I have been waiting six years for this moment, and I am delighted that it’s finally arrived. The technology has moved on in those six years, though. When I worked on my Ph.D. I essentially wrote all my own tools to do the editing work, and there was very little focus on usability, generalizability, or sustainability. Now the landscape of digital tools for text critical edition is much more interesting, and one of my tasks has been to get to grips with all the things I can do now that I couldn’t practically do in 2007-9. Over the next few weeks, as I prepare the article that I promised, I will use this blog to provide something of an update to what I published over the years on the topic of “how to make a digital edition”. I’m not going to explore here every last possibility, but I am going to talk about what tools I use, how I choose to use them, and how (if at all) I have to modify or supplement them in order to do the thing I am trying to do. With any luck this will be helpful to others who are starting out now with their own critical editions, no matter their comfort with computers. I’ll try to provide a sense of what is easy, what has a good user interface, what is well-designed for data accessibility or sustainability. And of course I’d be very happy to have discussion from others who have walked similar roads, to say what has worked for them. Update, two hours later: we have a solution! And it’s pretty disgusting. Read on below. Two posts in a row about the deep technical guts of something I’m working on. Well I guess this is a digital humanities blog. Yesterday I got a wonderful present in my email – a MySQL dump of a database full of all sorts of historical goodness. The site that it powers displays snippets of relevant primary sources in their original language, including things like Arabic and Greek. Since the site has been around for rather longer than MySQL has had any Unicode support to speak of, it is not all that surprising that these snippets of text in their original language are rather badly mis-encoded. Not too much of a problem, I naïvely thought to myself. I’ll just fix the encoding knowing what it’s supposed to have been. Well, I recognise that kind of garbage, I thought to myself. It’s double-encoded UTF-8. So all I ought to need to do is to undo the spurious re-encoding and save the result. Right? Sadly, it’s not that easy, and here is where I hope I can get comments from some DB/encoding wizards out there because I would really like to understand what’s going on. It starts easily enough in this case – the first letter is μ. In Unicode, that is character 3BC (notated in hexadecimal.) When you convert this to UTF-8, you get two bytes: CE BC. Unicode character CE is indeed Î, and Unicode character BC is indeed ¼. As I suspected, each of these UTF-8 bytes that make up μ has been treated as a character in its own right, and further encoded to UTF-8, so that μ has become Î¼. That isn’t hard to undo. But then we get along to that ω further down the line, which has become Ï‰. That is Unicode character 3C9, which in UTF-8 becomes CF 89. Unicode CF is the character Ï as we expect, but there is no such Unicode character 89. Now it is perfectly possible to render 89 as UTF-8 (it would become C2 89) but instead I’m getting a rather inexplicable character whose Unicode value is 2030 (UTF-8 E2 80 B0)! And here the system starts to break down – I cannot figure out what possible mathematical transformation has taken place to make 89 become 2030. Ideas? Comments? Do you know MySQL like the back of your hand and have you spotted immediately what’s going on here? I’d love to crack this mystery. Hint: It really, really, doesn’t make the user happy. So here is the Perl script that will take the garbage I got and turn it back into Greek. Maybe it will be useful to someone else someday! [*] Also, as I realized after posting this, except Mac, which used MacRoman. Standards are great! Let’s all have our own! Since I’ve changed institutions this year, I am in the process of migrating Stemmaweb from its current home (on my family’s personal virtual server) to the academic cloud service being piloted by SWITCH. Along the way, I ran into a Perl Catalyst configuration issue that I thought would be useful to write about here, in case others run into a similar problem. I have several Catalyst applications – Stemmaweb, my edition-in-progress of Matthew of Edessa, and pretty much anything else I will develop with Perl in the future. I also have other things (e.g. this blog) on the Web, and being somewhat stuck in my ways, I still prefer Apache as a webserver. So basically I need a way to run all these standalone web applications behind Apache, with a suitable URL prefix to distinguish them. And so I get a lot of nasty 404 errors and a broken application. where /var/www/catalyst/stemmaweb is the directory that my application lives in. # to its own named virtual host. The RequestHeaders inform the backend (Catalyst) that what we are calling “/stemmaweb” is the thing that it is calling “/”, and that it should translate its URLs accordingly when it sends us back the response. The second thing I needed to address was how to start these things up automatically when the server turns on. The guide gives several useful configurations for starting a single service, but again, I want to make sure that all my Catalyst applications (and not just one of them) start up properly. I am running Ubuntu, which uses Upstart to handle its services; to start all my applications I use a pair of scripts and the ‘instance’ keyword. description "Starman master upstart control"
author      "Tara L Andrews (tla@mit.edu)"
description "Starman upstart application instance"
There is one thing about this solution that is not so elegant, which is that each application has to start on its own port and I need to specify the correct port in the Apache configuration file. As it stands the ports will be assigned in sequence (5000, 5001, 5002, …) according to the way the application directory names sort with the ‘ls’ command (which roughly means, alphabetically.) So whenever I add a new application I will have to remember to adjust the port numbers in the Apache configuration. I would welcome a more elegant solution if anyone has one! One of the great ironies of my academic career was that, throughout my Ph.D. work on a digital critical edition of parts of the text of Matthew of Edessa’s Chronicle, I had only the vaguest inkling that anyone else was doing anything similar. I had heard of Peter Robinson and his COLLATE program, of course, but when I met him in 2007 he only confirmed to me that the program was obsolete and, if I needed automatic text collation anytime soon, I had better write my own program. Through blind chance I was introduced to James Cummings around the same time, who told me of the existence of the TEI guidelines and suggested I use them. After I joined Interedition I very frequently found myself talking to its head, Joris van Zundert, about all manner of things in this wide world of digital humanities. At the time I knew pretty much nothing of the people within DH and its nascent institutional culture, and was moreover pretty ignorant of how much there was to know, so as often as not we ended up in some kind of debate or argument over the TEI, over the philosophy of science, over what constitutes worthwhile research. The main object of these debates was to work out who was holding what unstated assumption or piece of background context. One evening we found ourselves in a heated argument about the application of the scientific method to humanities research. I don’t remember quite how we got there, but Joris was insisting (more or less) that humanities research needed to be properly scientific, according to the scientific method, or else it was rubbish, nothing more than creative writing with a rhetorical flourish, and not worth anyone’s time or attention. Historians needed to demonstrate reproducibility, falsifiability, the whole works. I was having none of it–while I detest evidence-free assumption-laden excuses for historical argument as much as any scholar with a proper science-based education would, surely Joris and everyone else must understand that medieval history is neither reproducible nor falsifiable, and that the same goes for most other humanities research? What was I to do, write a Second Life simulation to re-create the fiscal crisis of the eleventh century, complete with replica historical personalities, and simulate the whole to see if the same consequences appeared? Ridiculous. But of course, I was missing the point entirely. What Joris was pushing me to do, in an admittedly confrontational way, was to make clear my underlying mental model for how history is done. When I did, it became really obvious to me how and where historical research ultimately stands to gain from digital methods. OK, that’s a big claim, so I had better elucidate this mental model of mine. It should be borne in mind that my experience is drawn almost entirely from Near Eastern medieval history, which is grossly under-documented and fairly starved of critical attention in comparison to its Western cousin, so if any of you historians of other places or eras have a wildly different perspective or model, I’d be very interested to hear about it! When we attempt a historical re-construction or create an argument, we begin with a mixture of evidence, report, and prior interpretation. The evidence can be material (mostly archaeological) or documentary, and we almost always wish we had roughly ten times as much of it as we actually do. The reports are usually those of contemporaneous historians, which are of course very valuable but must be examined in themselves for what they aren’t telling us, or what they are misrepresenting, as much as for what they positively tell us. The prior interpretation easily outweighs the evidence, and even the reports, for sheer volume, and it is this that constitutes the received wisdom of our field. So we can imagine a rhetorical structure of dependency that culminates in a historical argument, or a reconstruction. We marshal our evidence, we examine our reports, we make interpretations in the light of received wisdom and prior interpretations. In effect it is a huge and intricate connected structure of logical dependencies that we carry around in our head. If our argument goes unchallenged or even receives critical acceptance, this entire structure becomes a ‘black box’ of the sort described by Bruno Latour, labelled only with its main conclusion(s) and ready for inclusion in the dependency structure of future arguments. Now what if some of our scholarship, some of the received wisdom even, is wide of the mark? Pretty much any historian will relish the opportunity to demonstrate that “everything we thought we knew is wrong”, and in Near Eastern history in particular these opportunities come thick and fast. This is a fine thing in itself, but it poses a thornier problem. When the historian demonstrates that a particular assumption or argument doesn’t hold water–when the paper is published and digested and its revised conclusion accepted–how quickly, or slowly, will the knock-on effects of this new bit of insight make themselves clear? How long will it take for the implications to sort themselves out fully? In practice, the weight of tradition and patterns of historical understanding for Byzantium and the Near East are so strong, and have gone for so long unchallenged, that we historians simply haven’t got the capacity to identify all the black boxes, to open them up and find the problematic components, to re-assess each of these conclusions with these components altered or removed. And this, I think, is the biggest practical obstacle to the work of historians being accepted as science rather than speculation or storytelling. Well. Once I had been made to put all of this into words, it became clear what the most useful and significant contribution of digital technology to the study of history must eventually be. Big data and statistical analysis of the contents of documentary archives is all well and good, but what if we could capture our very arguments, our black boxes of historical understanding, and make them essentially searchable and available for re-analysis when some of the assumptions have changed? They would even be, dare I say it, reproducible and/or falsifiable. Even, perish the thought, computable. A few months after this particular debate, I was invited to join Joris and several other members of the Alfalab project at KNAW in preparing a paper for the ‘Computational Turn’ workshop in early 2010, which was eventually included in a collection that arose from the workshop. In the article we take a look at the processes by which knowledge is formalized in various fields in the humanities, and how the formalization can be resisted by scholars within each field. Among other things we presented a form of this idea for the formalization of historical research. Three years later I am still working on making it happen. I was very pleased to find that Palgrave Macmillan makes its author self-archiving policies clear on their website, for books of collected papers as well as for journals. Unfortunately the policy is that the chapter is under embargo until 2015, so I can’t post it publicly until then, but if you are interested meanwhile and can’t track down a copy of the book then please get in touch! 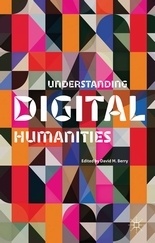 J. J. van Zundert, S. Antonijevic, A. Beaulieu, K. van Dalen-Oskam, D. Zeldenrust, and T. L. Andrews, ‘Cultures of Formalization – Towards an encounter between humanities and computing‘, in Understanding Digital Humanities, edited by D. Berry (London: Palgrave Macmillan, 2012), pp. 279-94. In the computer programming world I have occasionally come across the concept of ‘conference-driven development’ (and, let’s be honest, I’ve engaged in it myself a time or two.) This is the practice of submitting a talk to a conference that describes the brilliant software that you have written and will be demonstrating, where by “have written” you actually mean “will have written”. Once the talk gets accepted, well, it would be downright embarrassing to withdraw it so you had better get busy. In the autumn of 2007 I was afloat on that vast sea of Ph.D. research, no definite outline of land (i.e. a completed thesis) in sight, and not much wind in the sails of my reading and ideas to provide the necessary direction. I had set out to create a new critical edition of the Chronicle of Matthew of Edessa, but it had been clear for a few months that I was not going to be able to collect the necessary manuscript copies within a reasonable timeframe. Even if I had, the text was far too long and copied far too often for the critical edition ever to have been feasible. One Wednesday evening, after the weekly Byzantine Studies department seminar, an announcement was made about the forthcoming Cambridge International Chronicles Symposium to be held in July 2008. It was occurring to me by this point that it might be time to branch out from graduate-student conferences and try to get something accepted in ‘grown-up’ academia, and a symposium devoted entirely to medieval chronicles seemed a fine place to start. I only needed a paper topic. Matthew wrote his Chronicle a generation after the arrival of the First Crusade had changed pretty much everything about the dynamics of power within the Near East, and his city Edessa was no exception. Early in his text he features a pair of dire prophetic warnings attributed to the monastic scholar John Kozern; the last of these ends with a rather spectacular prediction of the utter overthrow of Persian (read: Muslim, but given the cultural context you may as well read “Persian” too) power by the victorious Roman Emperor, and Christ’s peace until the end of time. It is a pretty clearly apocalyptic vision, and much of the Chronicle clearly shows Matthew struggling to make sense of the fact that some seriously apocalyptic events (to wit, the Crusade) occurred and yet it was pretty apparent forty years later that the world was not yet drawing to an end with the return of Christ. Post-apocalyptic history, I thought to myself, that’s nicely attention-getting, so I made it the theme of my paper. This turned out to be a real stroke of luck – I spent the next six months considering the Chronicle from the perspective of somewhat frustrated apocalyptic expectations, and little by little a lot of strange features of Matthew’s work began to fall into place. The paper was presented in July 2008; in October I submitted it for publication and turned it into the first properly completed chapter of my thesis. Although this wasn’t the first article I submitted, it was the first one that appeared in print.